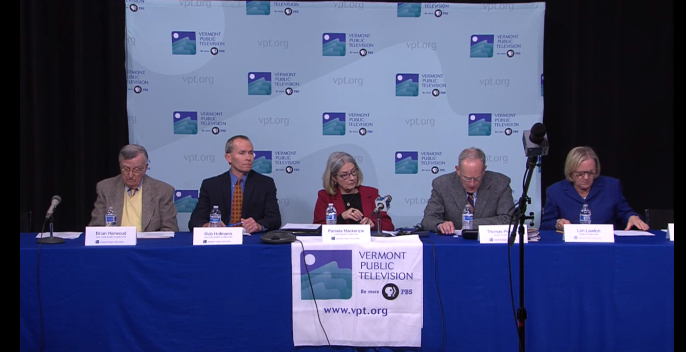 Vermont Public Television's board of directors affirmed its support for board chairwoman Pam Mackenzie and vice chairman Rob Hofmann Wednesday after board member David Taplin called on the pair to resign. The leadership discussion came after a board committee released the findings of an internal review of whether the station's volunteer leaders violated federal open meeting laws. The review was triggered by an anonymous letter sent to the Corporation for Public Broadcasting two months ago alleging that the board held at least 22 meetings in secret. Board member Tom Pelletier, who helmed the internal review, said that while the board and its committees had occasionally met behind closed doors, it did so for legally permissible reasons — for instance, to discuss "confidential personnel matters." "In short, none of the meetings were improperly closed to the public," Pelletier said. Nevertheless, Pelletier said, the board "did not fully satisfy the procedural requirement" to inform the public after the fact that such meetings had taken place. "Regrettably, this technical requirement was not fulfilled," he said. After reviewing hundreds of documents and interviewing fellow board members, Pelletier's audit committee found that four of the 22 meetings mentioned in the anonymous letter "did not, in fact, take place or did not qualify as meetings under CPB's open meeting requirements — for example, due to lack of a quorum." The committee found that an additional eight undisclosed meetings did take place, though he said all were "properly closed." The audit committee's findings will not be the last word on the matter. The CPB inspector general's office has been conducting its own investigation; its findings will determine whether VPT gets fined for breaching federal rules. After the board voted to accept Pelletier's report, Taplin raised concerns about the board's leadership. He recalled frustration expressed by VPT staff members at a board meeting earlier this month and calls by those employees for Mackenzie and Hofmann to resign. "This board of directors should be doing everything we can to support the staff and help them do their jobs more effectively," he said. "It seems to me that, lately, we have not been doing that. We have become more focused on the violations of open meetings laws that have occurred in the last two years." Taplin also expressed frustration that he and his colleagues were not immediately notified when board member Jim Wyant resigned his position last November. "This information was kept from half the board for over six weeks until January 8 of this year. I really find this inexcusable and I still have not received a clear explanation as to why this was done," he said. "PBS is the nation's most trusted institution, but we've lost the support of several longtime viewers and members. And a lot of the emails and phone messages to VPT related to these open meeting violations have called for the board of directors' leadership to resign. At this point I believe that's the right course of action to help put this controversy behind us." But Tapin appeared to be the sole voice of dissent. Eight other board members spoke out in defense of Mackenzie's and Hofmann's leadership — and the recommendation did not come up for a vote. "I disagree with you fully," former board chairman Brian Harwood said. "I find no reason for any resignations from anybody on the board. At all. And fully support not only what the audit committee has done, but what the board has done — and especially what the chair and the vice chair have done." The two leaders in question also addressed Taplin's call. Hofmann said he was "terribly disheartened" by the recent turmoil at VPT, saying, "It is not easy to sit here and have anonymous allegations and sniping and innuendo put out and have to be professional and not comment. It's incredibly frustrating." Mackenzie, too, defended her tenure on the board, saying that it has been "extremely hard" to respect the confidentiality of those who have made complaints to the board and those who have been on the receiving end of such complaints. “So I don't plan on resigning, because we've put a significant amount of hard work into this and I think we have lots of really good stuff to move forward with," she said.